WDC has given up on heat-assisted magnetic recording (HAMR) and is developing a microwave-assisted technique (MAMR) to push disk drive capacity up to 100TB by the 2030s. It's able to do this with relatively incremental advances, avoiding the technological development barrier represented by HAMR. These developments include multi-stage head actuation and so-called Damascene head construction. The current Perpendicular Magnetic Recording (PMR) technology uses vertically oriented magnetised areas in a disk drive's recording medium. Assume the recording medium has a uniform distribution of grains within it. A disk drive's write head magnetises an area of grains (a bit) with either a north pole or a south pole using an electrical field. The grains remain so-magnetised until re-magnetised by the write head. If we shrink the grain area to increase the areal density of the disk, and hence its capacity, they gradually become unstable, with their magnetism being affected by the magnetic state of their neighbours and temperature changes. PMR drives have passed 1Tbit/in2, with Toshiba's single platter MQ04 2.5-inch disk drive and its 1TB capacity as an example. But the technology can't go much further. The next step has been to move to a recording medium which is more stable in retaining its magnetised domains, and hence harder to write data as the grains have to be coerced more strongly into changing their magnetic polarity when data is written. With HAMR this is done by applying an intense blast of laser-induced heating to the grains, which makes it easier to alter their magnetic polarity. But adding the laser-heating source to the read/write head adds cost and difficulty, and ensuring its reliability, longevity and also that of the recording medium as it gets intensely heated and cooled repeatedly is also a challenge. Seagate, Toshiba and WDC have all been researching and trying to develop HAMR technology. These difficulties have been prolonged, so much so that WDC has decided MAMR is practical whereas HAMR is not. MAMR uses a different technique to coerce the magnetic domains to change polarity. It adds microwaves to the write head, using a spin-torque oscillator (STO) to generate them. Electrons in a magnetised area have a spin state, tending to spin one way or another. By applying microwaves at the right frequency a resonance effect can alter the spin state and make it easier for the write head's electrical field to alter the magnetic polarity of the domain. The STO's microwaves perform the same function, overcoming coercivity, as the HAMR head's laser but without the disadvantages. 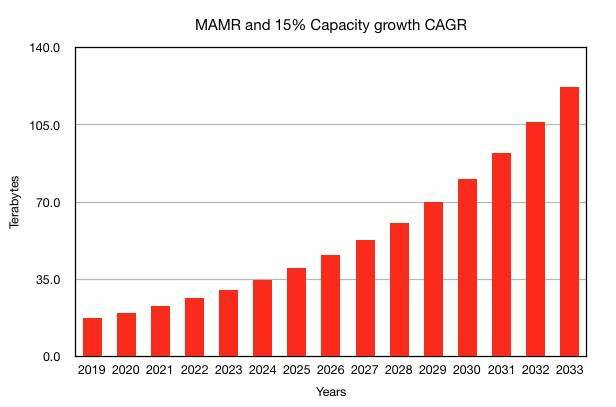 It thinks it can reach a 4Tbit/in2 areal density over time using MAMR technology, with a 15 per cent compound annual growth rate (CAGR) in capacity. Another incremental advance by WDC has been in its read/write head-building technology where it has developed the capability to add an STO device to the head. It calls it a Damascene process, in a nod to the process of forging Damascus steel for sword blades up until the 18th century. WDC describes (PDF) how it does this: "The main pole and the structures of the write head in the Damascene process are shaped and tapered by depositing and etching magnetic and non-magnetic materials. This process also enables the formation of a full wrap-around shield that helps to focus the magnetic field on to the target area being written while reducing interference on adjacent tracks." This enables tracks to be narrower and packed more closely together. That means the read/write head has to be positioned more accurately over the tracks, and WDC has a way to do that too. All disk drive manufacturers use multi-stage actuators to position the read/write heads over the disk platter surfaces tracks. Think of the read/write head as being at the tip of an arm. Imagine a single fingered hand at the end of your arm which has just a shoulder joint to position the finger over an object. Positioning would be crude. Add an elbow joint and positioning control gets finer. Add a wrist and it gets finer still. Add a finger joint and, yes, it gets even better, and then knuckles and... you get the picture. WDC has moved the final joint closer to the read/write head and called it a multi-stage micro actuator with finer track positioning capability. 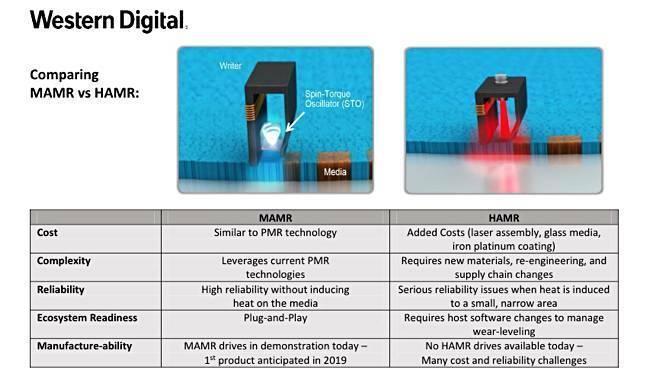 The combination of the micro actuators, the better shaped read/write head (Damascene process) and MAMR technology means WDC can see a way to 4Tbit/in2 drives quicker than with HAMR. 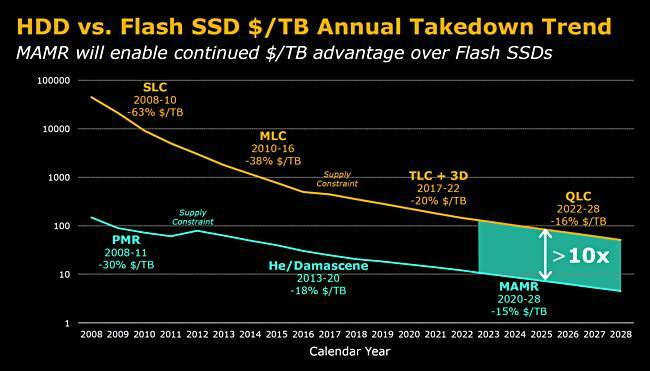 It shows a 106TB drive in 2032. The differential is 10x and that takes QLC flash into account.